We love using those big leafy chard greens for its big leafy greens, but what about those beautifully vivid rainbow stems? Ever wonder if there’s more you can do with those colorful stalks from rainbow chard? 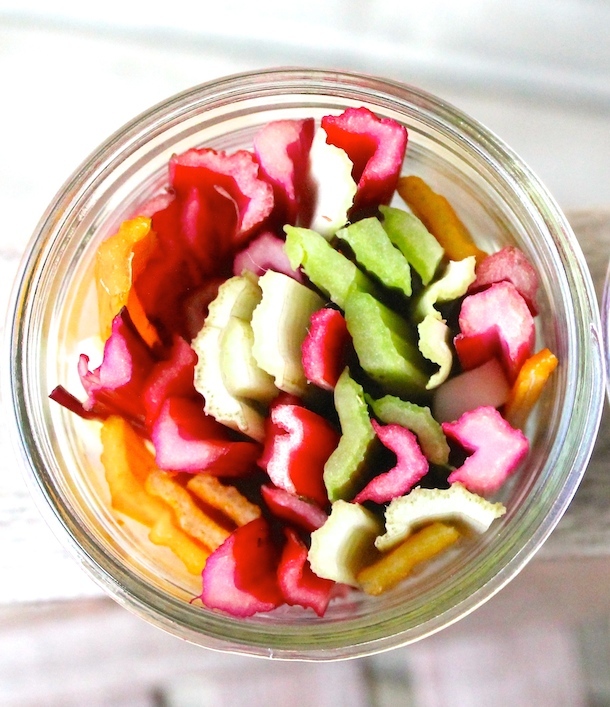 We are excited to share this pickled rainbow chard stalks recipe this week adapted from one of our favorite bloggers, HeartBeet Kitchen. The pickling preserves its beautiful vibrant color and are perfect for snacking on their own or topped onto your favorite savory dish to add a palate cleansing kick! Add the celery seed, peppercorns, mustard seeds, and garlic to the jar. Pack chard stems tightly into jars. Bring vinegar, sugar, salt, and Sriracha to a boil, in a small saucepan until sugar and salt is dissolved. Then, pour over chard stems. Let sit until cool, then put the lid on and refrigerate. We recommend waiting two days before eating for flavors fully develop! Enjoy!